South West Show 2011. That was today, that was. 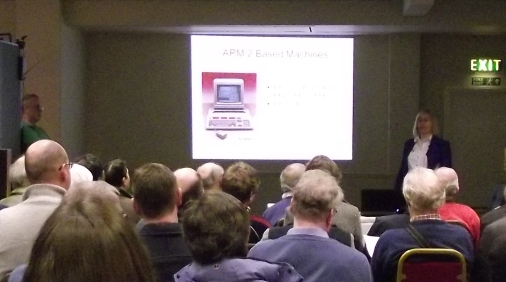 As a Bristol resident the annual RISC OS South West show, held at the Webbington Hotel near Loxton, is my local event – but one I almost always miss because it usually takes place in February and clashes with a regular holiday. This year, however, the show was held slightly later, so I was able to go along as a visitor. Having missed it for some years now I’ve no real notion of what the show is typically like in terms of the number of visitors, so I couldn’t say if there was an increase or not this year – but what I can say is that I was pleasantly surprised with the turn out. I can’t help but suspect that it is higher than previous years, and that the reason for it is a combination of the amazing coup that Paul Middleton managed by getting Sophie Wilson to do a theatre presentation, and R-Comp‘s decision to unveil their ARMini computer at the show. That’s the sort of combination that could have the South West Show challenging the Wakefield Show as the premiere event in the RISC OS calendar. I arrived at the show later than planned and perhaps spent too long talking to too few people, so I didn’t speak to all the exhibitors – and in fact spent a large chunk of the day stood at the back of the theatre area listening to the presentations. I made no notes (so all of what I say here is from memory – apologies in advance for any inaccuracies) and, although I took my camera and did remember to take a couple of pictures, I mostly forgot to use it. In my defence, this is my first attempt at writing anything about a show, so if you were exhibiting at the show and I don’t mention you… sowweeeeeeeee. Announced towards the end of this week, the ARMini is the new Cortex A8 based computer from R-Comp Interactive. It’s not ready for sale yet, with one of the key issues being to get relevant agreements in place with all concerned parties – but Andrew Rawnsley is reasonably confident that the wait shouldn’t be too long. 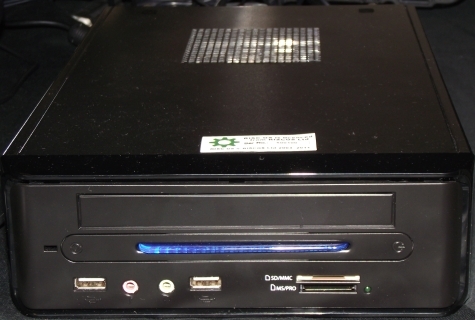 The price is expected to be around the £500 mark, probably plus VAT (with VAT at its new rate of 20%, it would be quite a feat if a small company such as R-Comp could produce and sell the machines in sufficient quantities to the very small RISC OS market and make a profit at an inclusive price mark of £500). However, even at £600 including VAT, this machine would be cheaper than, I think, most of the hardware options that have been available to us over the years – going right back to the days of Acorn. R-Comp are taking deposits (of £150) for this machine, but before everyone screams “Oh no, here we go again!” there is a significant difference between R-Comp’s approach and that of other companies to have taken deposits for new hardware in the past. R-Comp are tying customer deposits to hardware, so that if for whatever reason they are unable to proceed with manufacturing and supplying the ARMini, customers who have put down a deposit will still receive something – the card that forms the machine’s heart, the Beagleboard. R-Comp were on the right as you entered the hall, and on the left was the RISCOS Ltd stand. I didn’t actually speak to Paul Middleton until the very end of the day, and then only very briefly, and as I type this I realise I forgot to purchase a copy of his newly released RISC OS Classic ROM Collection – something I specifically wanted to purchase at the show. D’oh! Moving around to the right, CJE had a vast array of things to buy, as usual. I cornered Andrew Conroy to ask him about the situation with the late Paul Vigay’s software, which Archive magazine has reported him to be taking over. His plans are pretty much as reported in Archive – initially to just get the software online and available, with the longer term plan to being to update and open things up. Some of Paul’s software was commercial and required an activation key and Andrew plans to initially just supply the keys by email when people need them, with that aspect of the relevant software likely to be the first target of any updating, in order to remove the requirement. Jim Nagel was in the middle of the hall, providing the latest Archive magazine, issue 22:12, to subscribers and taking renewals – and hosting a little stack of flyers on behalf of yours truly detailing the 2nd meeting of subscribers to the Bristol RISC OS Users mailing list. At the end of the day, Jim commented that around 50 people had collected their copy of Archive at the show – and I noted during Sophie Wilson’s theatre presentation (when the main hall was all but empty) there were approximately 50 people listening eagerly to what she said. That’s not a huge number of people, but as I said at the start, I was pleasantly surprised – it was more than I expected. Back over to the right, and Martin Würthner was on hand with ArtWorks 2, EasiWriter, etc., which he also talked about in his theatre presentation. A rather handy new feature he demonstrated in ArtWorks was the ability to copy the attributes of one object and apply them to another, which looks to me like a very useful feature; this would allow you to have a document containing various objects, with various sets of attributes, that you could use as a kind of graphical menu of styles you commonly use. For EasiWriter, he mentioned the fairly recently added capability of importing Docx files, demonstrating it by loading the specification document. Martin also discussed PPD, an application that opens PostScript Printer Description files and presents the user with a dialogue allowing them to change many more printer settings for their PostScript printer than the traditional RISC OS printer driver system is able to support. At the back of the hall were the second hand and charity stalls, with almost nothing I actually wanted to purchase on either, but plenty of things on display that raised a nostalgic smile, from old manuals and user guides, through to games I once wasted plenty of time on, and hardware of various types – and with a box of random cables on the floor, for a moment I thought I was standing in my shed. Why do I keep these things? Why? Anyway, I said “almost nothing” – I did actually intend to pop back towards the end and buy that graphics book from you, Moss, but I forgot! Oh well. The show was rounded off with the theatre presentation from none other than Sophie Wilson, in which she talked about Acorn’s origins and how the various decisions and designs came about, some of the problems they faced, and so on, leading up to Acorn’s demise and beyond – including a very interesting piece about processor design covering the implications of the famous Moore’s Law and less famous Amdahl’s Law. All in all, I thought it was a very interesting show. There weren’t a great many more exhibitors than I’ve mentioned here, but with the ARMini being shown in public for the first time, and an afternoon listening to some interesting and entertaining theatre presentations, there was still plenty to keep visitors interested for the day. All in all, I’d say the show was a successful one, and would like to thank all those involved in organising it.